We are glad to welcome Meg Thompson as a guest author today. Meg currently teaches at Brownell Middle School, named for E. E. Brownell, a California educator who was named for Colonel Elmer Ellsworth and is related to Corporal Francis Brownell, the man who killed Ellsworth. She has also taught at other public schools in California and Maryland. Meg contributes to World At War and Strategy and Tactics, history and war-gaming magazines. Her undergraduate degree in Liberal Studies with a minor in American History was from California State University, Long Beach, and is preparing to earn a Master’s degree in History, with a Civil War emphasis. Visit Meg’s blog. “Just who is Elmer Ellsworth and what is he doing in Washington, D.C.?” This was only one of the questions asked after Abraham Lincoln’s inauguration on March 4, 1861. Among the men who accompanied the President-elect on the Inaugural Special train trip from Springfield to the Capital, Elmer Ellsworth, John Hay, and George Nicolay garnered a lot of attention, mainly due to their youth, good looks and access to Lincoln. Hay and Nicolay were Lincoln’s private secretaries, but who was the short guy in the funny uniform? Elmer Ellsworth had no military record, nor was he a lawyer or a secretary. There must be more to this story, and, of course, there is. In the late 1850s, the United States Army had just about 16,000 men in uniform, most of them serving in the far west. There had been whiffs of civil war as early as the Missouri Compromise, which rapidly increased as Kansas became Bloody and as John Brown decided the time was excellent for a slave uprising at Harper’s Ferry. President Buchanan had lost control of the southern politicians, and disunion was daily becoming more probable. Neither the North nor the South was in any way militarily prepared for a war. Cities and small towns had militia companies, based on the colonial concept that armed protection should be a local responsibility, but because there had been no uprisings of any size since the War of 1812, the companies had grown lax. Many were now social clubs that walked together in parades, or got dressed up in uniform to bury one another. These volunteer militias were in no way ready to help the United States Army fight a real war, and this was a problem. Elmer Ellsworth had been some sort of soldier for most of his life, but never in the regular Army. He had drilled militia groups in New York, Illinois, and Wisconsin, and had quite a good reputation as being a leader who could give a militia company the discipline needed to compete at a more demanding level than the local patriotic parade on July 4. However, Ellsworth’s skill at handling soldiers in a real war–with bullets–was completely untested. No one was more aware of this than Ellsworth himself. The militia was his passion, but politics made plain that if there was a war, the militias were going to have to be in the military vanguard until the regular army was fully recruited and trained for service. How this should be accomplished was Ellsworth’s first concern. His prominence in Illinois militia circles brought him into contact with such Chicago power-brokers as General R. K. Smith, General Simon Buckner, and soon-to-be-governor Richard Yates. These men mentioned him to aspiring Republican presidential candidate Abraham Lincoln. Lincoln was aware, even before he met Ellsworth, that this young man was one to be watched. Rather than take his theories of national defense to the Illinois politicos, Ellsworth worked on his own to design, then perfect, a form of military drill based on that of the Algerian forces of the Crimean War. He recruited, equipped and trained a company of just over fifty young men in this exacting drill, creating the United States Zouave Cadets, a living embodiment of his militia ideas. After training the cadets for about a year, the company won a regional competition against other militia drill teams. At that point, the Cadets began what John Hay refers to as their Marche de Triomphe. “Hardly had they left . 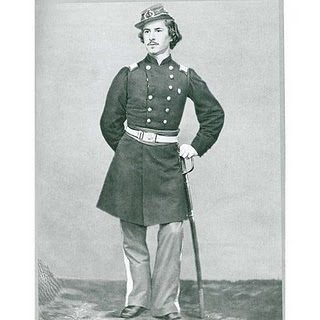 . . Chicago when the murmur of applause began.” The Cadets, led by Ellsworth, went on a barnstorming tour of the Northeast in the summer of 1860. The “regiment” performed their stunning acrobatic actions and dazzling march sequences with weapons, including bayonets. They took the North, state by state, with their dynamic performances. As the Cadets left each town or city, new military companies sprang up behind them, eager to develop into prepared citizen militia groups. When the U. S. Zouaves returned to Chicago, Ellsworth and his men were the nineteenth century equivalent of rock star performers. 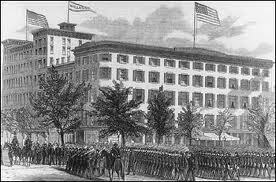 The tour had successfully raised the military consciousness of the Union. When Elmer Ellsworth met Abraham Lincoln, the proverbial die was cast. They liked and respected each other from the start, and Lincoln extended Ellsworth an invitation to come to Springfield to study law. First–the gradual concentration of all business pertaining to the militia now conducted by the several bureaus of this Department. Second–The collection and systematizing of accurate information of the number, arm(s), and condition of the militia of all classes of the several States, and the compilation of yearly reports of the same for the information of this department. Third–The compilation of a report of the actual condition of the militia and the working of the present systems of the General Government and the various States. Fourth–The publication and distribution of such information as is important to the militia, and the conduct of all correspondence relating to militia affairs. Fifth–The compilation of a system of instruction for light troops for distribution to the several States, including everything pertaining to the instruction of the militia in the school of the soldier,–company and battalion, skirmishing, bayonet, and gymnastic drill, adapted for self-instruction. Sixth–The arrangement of a system of organization, with a view to the establishment of a uniform system of drill, discipline, equipment, and dress, throughout the United States. 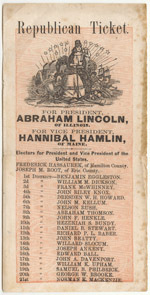 With Lincoln’s encouragement, Ellsworth put his ideas into the form of a bill and presented it before the Illinois Legislature. If passed, it would have put that state far ahead of other northern states in military preparedness. It was presented late in the legislative term, however, and the term expired without passage of the bill. Ellsworth was encouraged to resubmit it during the next term, but by that time he was in Washington, D. C. as a member of the Presidential entourage. The day after his inauguration, March 5, 1861, Lincoln wrote a letter to Secretary of War Simon Cameron. This letter requested that Ellsworth be given a job as Chief Clerk in the War Department. This would get Ellsworth’s booted foot into the heavy oak door, where he would be soon appointed head of the newly created Bureau of Militias at the rank of Major. With the amount of shoulder straps hanging around the Capital looking for promotion, it is easy to imagine that this did not set well with the West Pointers and Army Regulars. Ellsworth was upset and embarrassed, and agreed to accept another, lesser job and the rank of a lieutenant. As a daily visitor to the White House, he continued to network with such persons as Thurlow Weed, Judge David Davis, Major David Hunter and Captain John Pope, all of whom could see the necessity for having a plan in place to quickly and professionally weave the volunteer militias of the North into the U. S. Army. Arrangements were made to see Simon Cameron en masseto discuss Ellsworth’s ideas, presenting him with a letter from President Lincoln which heartily endorsed the idea of a Bureau of Militias. By March 18, the letter was almost ready, and details were being finalized. As mentioned above, Ellsworth had been at the White House every day since the Lincolns had moved in. Not only had he been to see the President and his friends John Hay and George Nicolay, he had been to see Willie and Tad Lincoln, the President’s young sons. 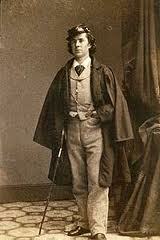 Ellsworth was greatly loved by the Lincoln family, and had been since he first met them. He was called by Mary Lincoln’s cousin, Elizabeth Grimsley, a “pet of the family” and played with Willie and Tad as if he were a child himself. The boys had both come down with measles, and by March 20, so had Elmer Ellsworth. Initially Ellsworth thought it might be smallpox, which had killed his younger brother the year before. 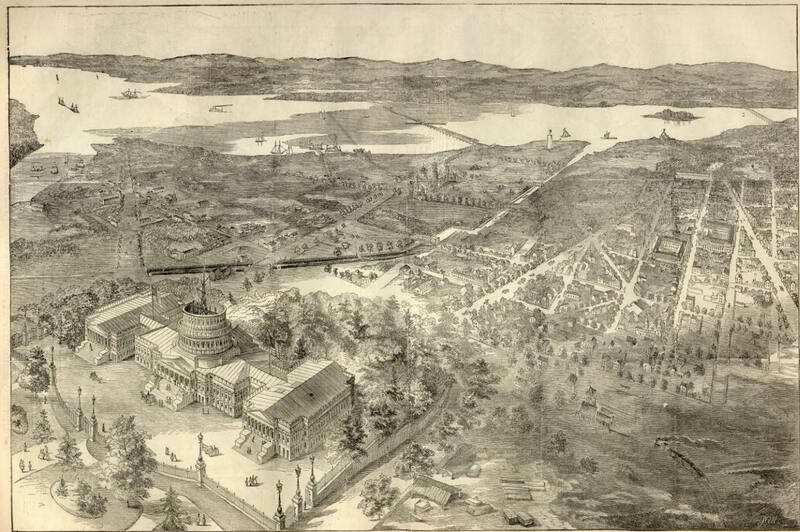 He hysterically locked himself in his room at Willard’s Hotel and told no one that he was ill.
Elmer Ellsworth in Washington D. C.
Sumter fell, and the sleeping North awoke. By April 15, Ellsworth, still weak from his bout with measles, had resigned his lieutenant’s commission and started for New York. He went without orders, but knew that Abraham Lincoln supported his actions, as he had a letter of introduction from Lincoln to Horace Greeley in his coat pocket. In just six days Elmer Ellsworth had enlisted and organized an eleven-hundred-man regiment composed mainly of the volunteer firefighters of New York City. The First New York Fire Zouaves, the flashiest, most boisterous volunteer militia ever to march down Pennsylvania Avenue, would be the proof he needed to show that his militia plan would work. This entry was posted in Emerging Civil War, Leadership--Federal and tagged Elmer Ellsworth, George Nicolay, John Hay, Lincoln, militia, zouaves. Bookmark the permalink. A really overlooked early war character. I think most just associate him with his death. I think few really know who Ellsworth was. Nice story. Great article Meg. It is easy to speak of the events and forget the people behind them and you have dug up one of the more interesting ones. Look forward he hearing more!